The beautiful Hilton El Conquistador will be the host venue for this year's USTA Southwest 40 & Over Adult League Championships, May 2-4, 2014. This three-day event will bring together some of the top league teams in various skill levels from across the Southwest, teams from cities like Phoenix, Flagstaff, Las Cruces, Albuquerque, El Paso and the host city of Tucson. Local league winners will duke it out on court for Section pre-eminence and a shot to advance on to the USTA League 40 & Over National Championships held in the Fall of 2014. Four separate flighted NTRP skill levels - 3.0, 3,5, 4.0 and 4.5 - are how the teams are divided in Tucson. Each team will play a five-court format of two singles and three doubles per team match. More than 300 players are expected to attend the 2014 championships. Matches will begin at 7 a.m. each of the three days, with the last rounds going off on early afternoon Sunday. Below is tournament information about this year's championships. A playing schedule will be added in late April. More information will be added to this page, so check back periodically for updated info. The main host site for the 2014 USTA Southwest 40 & Over Adult League Section Championships is the Hilton El Conquistador Golf and Tennis Resort. 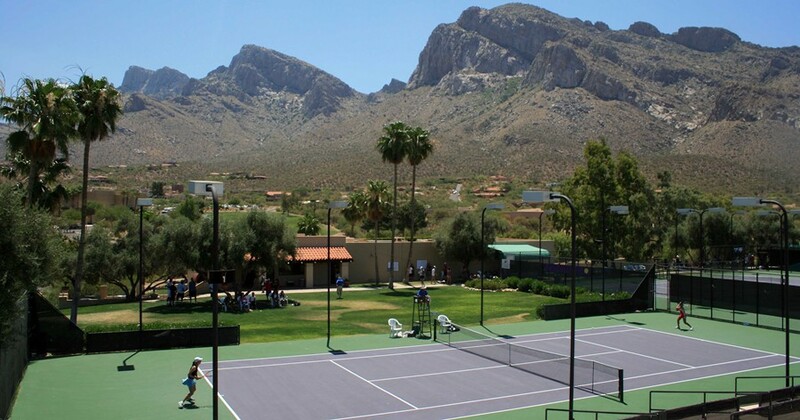 The 16-court lighted facility is one of the Southwest's and, indeed the United States', most beautiful tennis centers, resting in a gorgeous spot at the base of the Santa Catalina Mountains. The facility is consistently rated as our players' favorite tournament destination, and it has hosted an array of top flight events in past years, including USTA League National Championships, past USTA Southwest League Championships in each category, the USTA Southwest Senior Closed, and the USTA Southwest Junior Closed. 'El Con' as it's affectionately known, has been a perennial Top 50 Tennis Welcome Center in the United States and is a Four Diamond golf and tennis resort with an extensive array of amenities, like two championship golf courses, spa, pool. etc. The facility also boasts a 15-court tennis complex at the nearby Hilton El Conquistador Country Club. We will be using both sites. The resort has blocked off rooms for the 40 & Over Adult League Section Championships players at a stellar rate of $129/night plus taxes. Players should reserve directly with the hotel and identify themselves as part of the USTA Southwest 40 & Over League Section Championships 2014 block. Online booking can be found at www.hiltonelconquistador.com (Use the group code "SOS" when reserving your rooms on the website or by phone). The deadline for online reservations is April 14, 2014, so make reservations as quickly as you can. Due to the likelihood of a sellout at Hilton El Conquistador, USTA Southwest has made arrangements for an additional hotel very close to the tournament site, the Fairfield Inn & Suites Tucson North/Oro Valley. Players can book their rooms online for a rate of $109/night by clicking HERE. Last day to book at this rate is April 18, 2014. 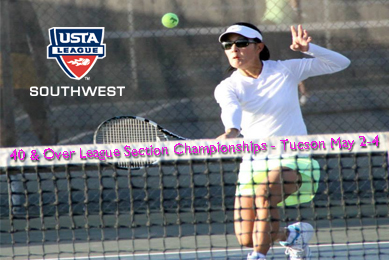 When reserving room, please mention that you are part of the USTA Southwest 40 & Over Section Championships. The final process to team registration is held Thursday, May 1 from 6-7 pm at the Hilton El Conquistador Golf and Tennis Resort (Agave Meeting Room), and the captain's meeting is from 7-7:30 pm. Players and teams are encouraged to interact with us on our Facebook, Twitter, and Instagram platforms all year long at your local levels, district championship and Section League Championship tournaments. The Twitter and Instagram hashtags will be "SWLEAGUE14". Search us on these platforms at "USTA Southwest" and you'll find us. We want to see you guys get to the net in a different way as well. Special thanks goes out to Head/Penn Racquet Sports for being the official ball sponsor of USTA Leagues. They have been a longtime sponsor of the USTA League Program. Their home base is in Phoenix, and we truly appreciate their terrific support, which also includes gifts and lots of fabulous prizes and great items at our Player Party!